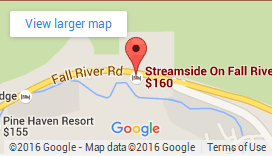 Streamside is a great “base camp” for your vacation. Of course, you will want to get out and explore Rocky Mountain National Park and the Town of Estes Park. But when you are not out exploring, there’s lots for your family to do at Streamside! The Fall River runs right through Streamside and offers tremendous fishing opportunities. Complimentary fishing poles (subject to availability) are available from the Front Desk. A fishing license is required. They are available for purchase at multiple locations in town, including Kirk’s Fly Shop. Fishing at Streamside is catch and release only. On the hillside above the Streamside Front Desk is a hiking trail that takes guests up to Old Man Mountain. Some of this trail is on Streamside property; some travels through neighboring private properties with permission. Leave no trace and enjoy the amazing rock formations and views of Estes Park and Rocky Mountain National Park. Our large lawn is the perfect place to play with the kids. Enjoy a game of horseshoes! Or come to the Front Desk to check out a croquet set or lawn darts! Turn the TV off and enjoy your time together playing classic board games. The Front Desk has a wide variety of games for kids (and adults) of all ages! Vacations are a great time to catch up on movies… check out the movie list in your guest directory and come up to the Front Desk to check them out!